Cluss designed Eastern Market during his time as the City's Engineer and member of the Board of Public Works in the early 1870's. Large areas, natural illumination, and well-ventilated halls were considered an absolute necessity for a modern city market. President Thomas Jefferson established the first Eastern Market in 1805 by Presidential Proclamation. A traditional open market-cross arcade, shaped in a "U" pattern capping a central canal, rose adjacent to Washington Navy Yard, at 6th Street between K and L streets, S.E., in 1806: this was the market Cluss knew from working at the Yard in the 1850s. The Civil War strangled the market's business; by 1873 it had degenerated into a "disgraceful shed." Charged with creating a "New Washington", early in 1871 the new Territory of the District of Columbia approved a new Eastern Market, awarding the design contract to Cluss. 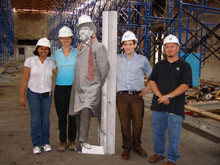 As a member of the Board of Public Works, Cluss thus awkwardly supervised himself in this project. 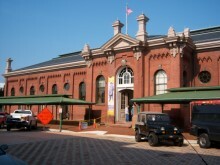 At the same time, he worked on the design of the Washington Center Market and Alexandria, Virginia City Market. His research toward Center Market, who was to become the largest market in America at that time, benefited the design of the little neighborhood market on Capitol Hill, a working-class backwater. Cluss designed a new brick market hall, 55 meters (180.45 feet) long and 15 meters (49.21 feet) wide, on 7th and C Streets, SE. Like Center Market, the new Eastern Market was constructed as an open, 3-leveled hall, with iron beams and generous skylights. In November 1873, the first vendors opened their stands. Altogether 80 booths sold meat, poultry, butter, vegetables and oysters to the public. The old market was, with Cluss's advice, demolished under Governor Alexander Shepherd in 1874. Eastern Market was an instant hit, with advanced lighting and ventilation through ceiling vents and a soaring truss roof. Basement meat coolers served so well that butchers preferred them to refrigeration well into the 20th century. A basement refectory served as a social center and a militia armory, while the storage area became a rifle range by 1916. A block from Cluss's breakthrough Wallach School (1864), Eastern Market became the anchor of a 19th-century civic and commercial complex, featuring a fire station and a high school. In 1908, the city added two halls, contracted by Snowden Ashford, to the Eastern Market. The section of the hall designed by Cluss became known as the South Hall. As with Center Market, at the beginning of the 20th Century, the importance of Eastern Market declined as a main distributor of fresh groceries. Since the 1930s, a citizen initiative successfully prevented the demolition of the market. Thanks to an initiative of businessmen, new interest in Eastern Market was awakened in the 1950's. 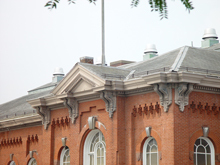 In 1964, the building was classified as a District of Columbia historic landmark and in 1971 was included in the National Register of Historic Places. In the early morning hours of April 30, 2007, a terrible fire ravaged the building. Over 160 firemen fought two hours to extinguish the fire, which was probably the result of an electrical problem. The fire caused $20 million damages and destroyed fourteen businesses. 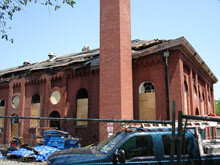 Many D.C. residents as well as Washington D.C. Mayor Adrian Fenty and his administration vowed to restore this unique market place. The restoration work took place from July 2007 to June 2009 under the direction of Quinn Evans Architects. The reopening was celebrated on June 26, followed by a community celebration on the next day. Renovation costs amounted to $ 22 million. 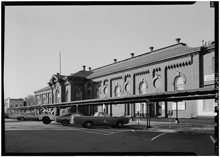 While preserving its historical appearance, the market's internal infrastructure was completely modernized with modern heating and air conditioning, new restrooms and sprinklers. Skylights and chimneys have been restored and new windows have been installed that protect against ultraviolet (UV) light. The North Hall was provided with a movable stage and gallery walls, a demountable dance floor and theatrical lighting making it attractive for community and rental use. Today, Eastern Market is once again the lively civic heart of its neighborhood, still a food market, animated with weekend flea markets and community activities, and very much the urban center Cluss envisioned. It is one of the few public markets in the city and the only one maintaining its original role as a public market. Impressions of the atmosphere at Eastern Market can be found at: www.easternmarket-dc.org as well as at www.easternmarket.net.